Sometimes I make a 13″x 9″ pan, cut it into a dozen squares, and we have a quick breakfast on hand when one of us is dashing out in the morning. It is so good, that my oldest daughter asks for another one right after she’s finished with the first piece. If there are any leftovers after 2 days, I freeze portions, which can even be microwaved. My 85 year old neighbor has been in a nursing home for a couple of weeks. He’ll be coming home this week, so I’ve been cooking a bit extra of whatever we eat of every night and freezing 1 or 2 portions for him. Since he lives alone, I’m never sure if he eats properly, so I’ll been saving half of this Asparagus Mushroom gluten-free quiche for him as well. 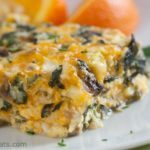 It’s got everything in one dish – eggs, cheese and lots of vegetables. He’ll need the extra bit of protein as well. This version has asparagus, mushrooms and Jarlsberg cheese, but you can substitute another cheese if you wish. Swiss, Gouda or even a combination of cheeses would work well. A hint of thyme, white pepper and nutmeg give it a nice flavor. Jarlsberg, asparagus, mushroom and thyme. 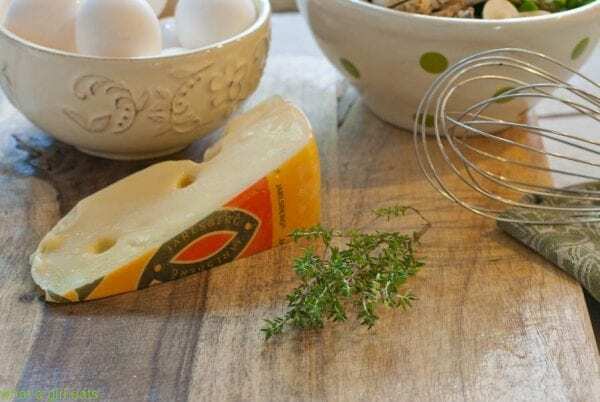 I was craving an asparagus and Jarlsberg version, and I thought the buttery, nuttiness of the cheese would be complimented with a bit of fresh thyme. 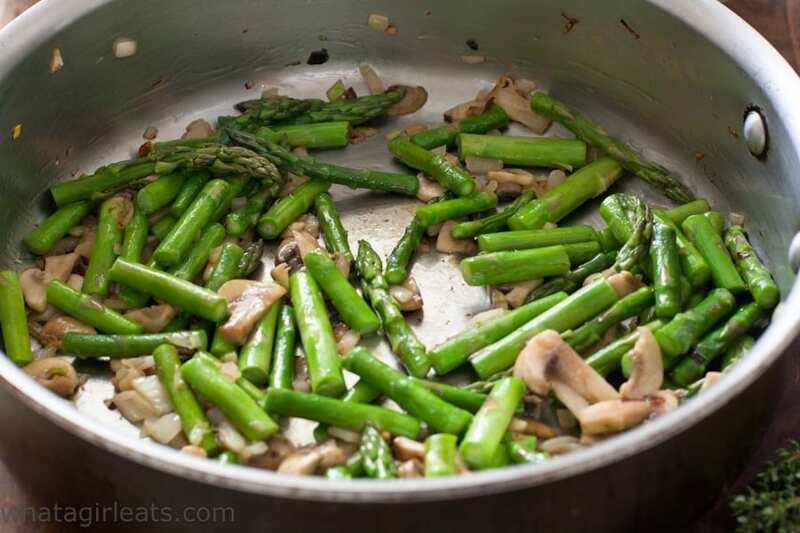 Saute asparagus, onions and mushrooms for a few minutes. 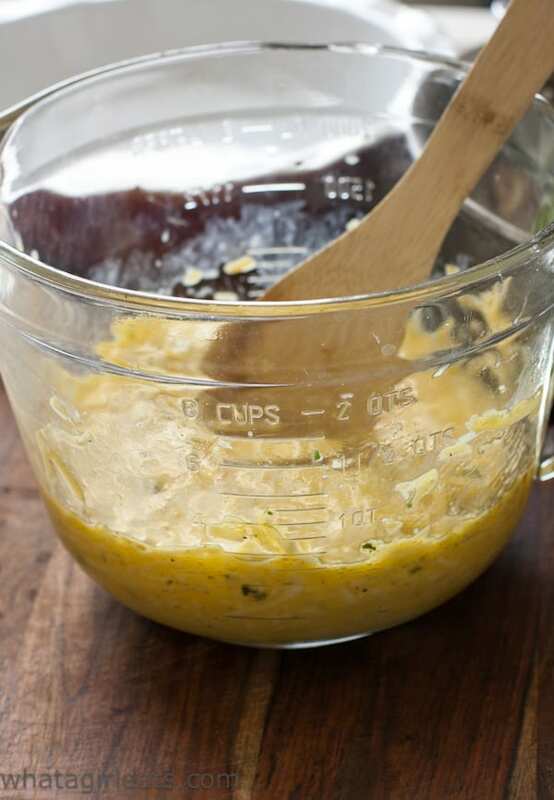 Blend the eggs, cheese, thyme and spices together. Add the sauteed vegetables. Mix eggs, cheese and sauteed vegetables together. 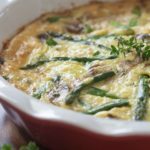 Asparagus, mushroom, cheese and thyme, crustless quiche. 3 cups asparagus trimmed and cut into 1" pieces. In a saute pan, melt butter and olive oil over a medium heat. Add onions and sauté 3-4 minutes until soft and translucent. Add asparagus and mushrooms and continue cooking an additional 3-5 minutes or until asparagus is crisp tender and mushrooms are soft. Set aside to cool. In a large bowl, beat eggs, add cheese and seasonings. Pour into baking dish and bake for 30 minutes at 350 degrees F. until center is firm and edges are golden brown. 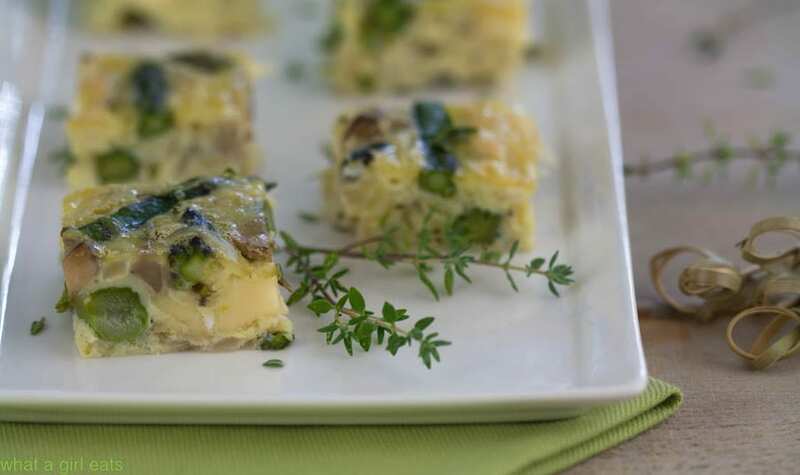 Let cool slightly and cut into bite sized pieces for appetizers or 12 for breakfast portions. I’ve made modifications for a slightly smaller amount. I measured my 13″x 9″ baking dish and it holds about 8 liquid cups. My deep dish pie plate holds 5 liquid cups and my smaller, traditional quiche dish holds 4. You could certainly keep the measurements for the 13″ x 9″ version, fill a dish dish, quiche dish or even a pie plate with mixture. Pour the leftover mixture into muffin cups and bake like these. If you’d like a slightly smaller amount, here’s the deep-dish version. Note that the baking time is the same, and this one is deeper and will turn out thicker. 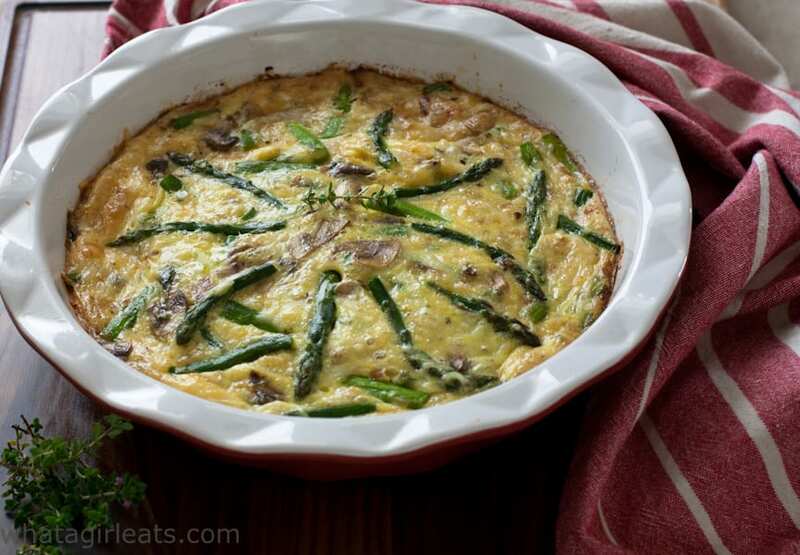 Asparagus, Mushroom and Cheese Crustless "Quiche"
This is a modified version to the recipe above. Bake it in a deep-dish pie plate, or large quiche dish. Heat oven to 350 degrees F. Grease a 9" deep pie dish. In a saute pan, over a medium heat, melt butter and olive oil. Add onions and saute 3-4 minutes, until soft and translucent. Add asparagus and mushrooms and continue cooking an additional 3-5 minutes or until asparagus is crisp tender and mushrooms are soft. Set aside. In a large bowl, beat eggs. Add cheese, fresh thyme and seasonings. Fold in sauteed vegetables. Pour into greased baking dish. Bake for 30 minutes, or until center is firm and edges are golden brown. Let cool slightly to set before serving. 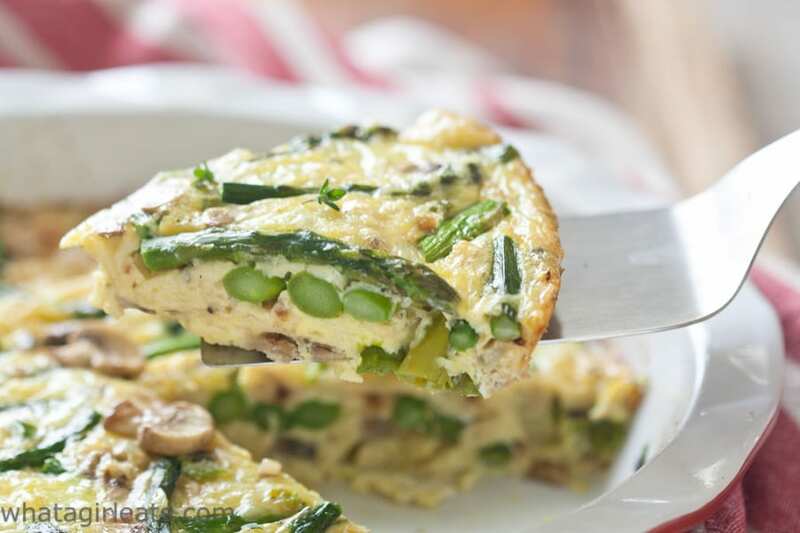 These types of quiches are great to make for breakfast. I like to make them when I have company. So easy to prepare the night before, refrigerate and bake in the morning. It is also a good way to use up whatever extra vegetables or bits of cheese are on hand. Can’t beatt asparagus and mushrooms, though. 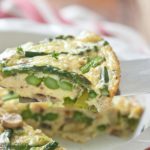 I have never made a Quiche, but this looks easy! Seems I can just throw in whatever I have in my fridge in one. I will have to try this! Amber, absolutely! I’m making another tomorrow with broccoli and mushrooms! 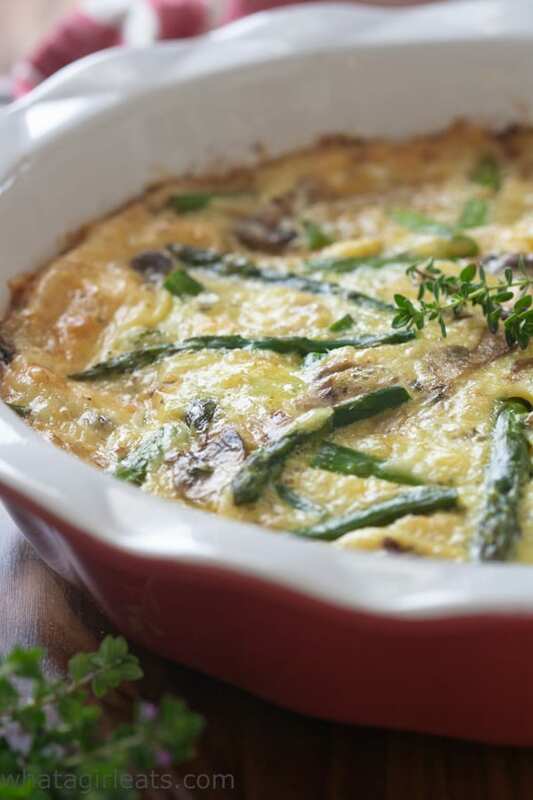 You had me at mushroom and then the asparagus and quiche pulled me in completely! This sounds SO good and I can’t wait to try it out. Thanks for sharing at Who Needs A Cape?’s Super Sunday Link Party and be sure to stop back for more linky fun! Thanks for stopping by Sherry…I just linked up something today. Your quiche looks delicious! 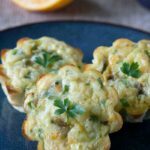 I love making crustless quiches (even though I do like the buttery crust), I don’t feel guilty eating them! @Ada, believe me, I LOVE crust…I could just eat the buttery crust alone, but this has a lot of the fun…with way fewer calories! Can you pls let me know the recipe for the spinach, red peppers and mushroom version? Thank you so much!! how many eggs is two cups? about 4 per cup, but it depends on your egg size…I use between 8-10 eggs when I make this recipe. 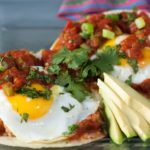 This is so quick and easy without the crust, and I love the capability of customizing the ingredients each time! I love quiche, but rarely make them. Need to keep this recipe in mind! Thanks, Cynthia! Yes…it’s perfect for springtime produce too! As a European follower I’d appreciate it if you could also use metric. It’s too much of a hassle to calculate imperial into metric. So I tend to incorporate some of your ideas into my own cooking. 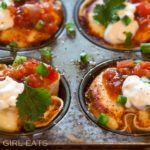 I have a converter app on my site and I’m working to add metric to all my recipes. Was there something you didn’t like about the quiche? You rated it 3 stars.